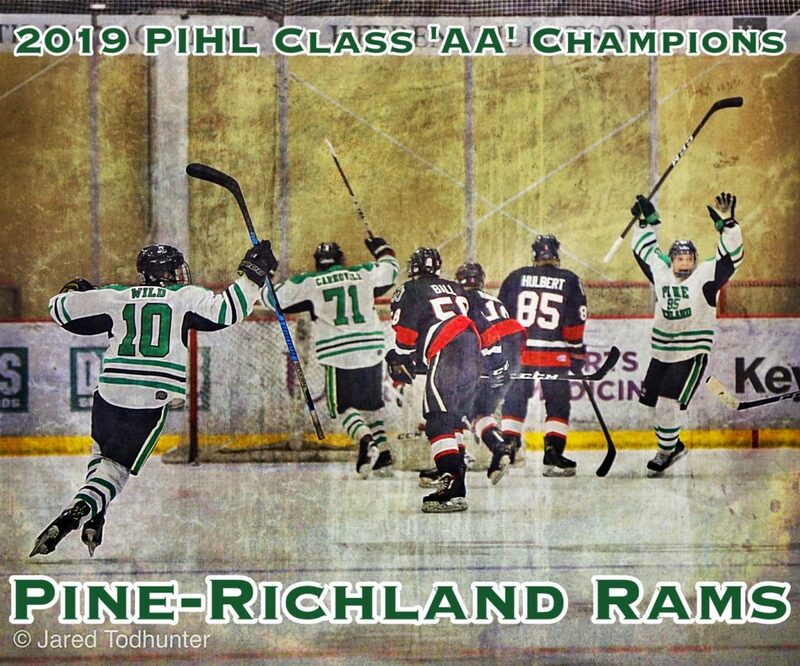 CRANBERRY TWP., Pa. — Pine-Richland got two goals each from Jared Eggert, Joseph Folmer and William Studt, as the Rams out-raced Upper St. Clair, 7-5, for their fourth PIHL Penguins Cup title. Pine-Richland entered the postseason as the top seed in Class-AA and finished its 2018-19 season without a regulation defeat. The clincher didn’t come easily. Pine-Richland built a 4-3 lead through two periods, but the Panthers came out on fire to start the third, with Anthony Carone and Quinn Giacobbe striking on the power play in the first two minutes of the final frame to give Upper St. Clair a 5-4 lead. The Panthers power play proved to be a problem for the Rams throughout the night as all five of their goals came on the power play. But the Rams fought back, with Studt tying the game at 6:18 of the third, Eggert scoring the game-winner just over a minute later and Folmer adding a crucial insurance marker. Daniel Stauffer held the fort in goal, stopping 34 of 39 as the Panthers furiously tried to regain the advantage in the back-and-forth affair. Pine-Richland looks to carry that confidence into the 2019 Pennsylvania Cup. “It feels great. It’s the first time in I don’t know how many years” said Jared Eggert. “Last time, our coaches were playing and it feels good to take them back”. The Rams will face the Downingtown East Cougars at RMU Island Sports Center on March 23 in the Class-AA state title game.